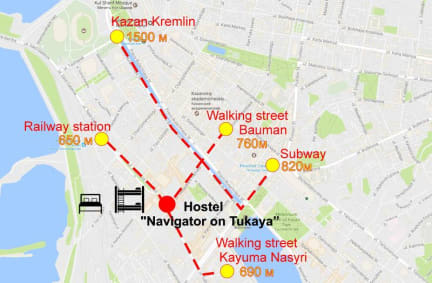 Hostel Navigator na Tukaya i Kazan, Russland: Bestill nå! We ultramodern hotel, officially opened in April 2016, located in the heart of the city of Kazan. In our hostel you feel yourself like in home! Friendly receptionist and great atmosphere! Our hostel is an optimal ratio of price and quality! We are in the heart of the city, we are cheap and convenient. We are located very close to the Central Railway Station (Kazan Passazhirskaya - Terminal 1) in the historical center of Kazan. The district where the hostel is situated used to be a Muslim part of Kazan where Tatars lived. Some ancient mosques are situated in the neighborhood of our hostel. Hostel Navigator na Tukaya - new equipment, newly renovated, the building has historical value! 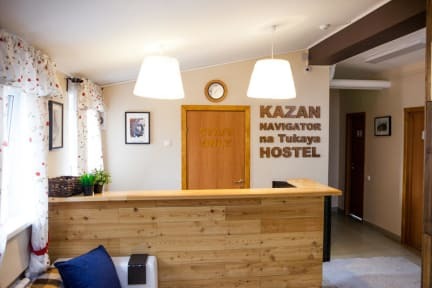 Here you will find: free Internet Wi-Fi, equipped kitchen with free tea and coffee, in the rooms there is everything for comfortable living, non-stop reception of guests, polite, friendly staff, discount for group settlement, information support, registration of foreign citizens in the Federal Migration Service. Many vivid memories of Kazan with us!